James Tennant was well known in Victorian scientific circles, primarily for his geological studies and lectures. He was the first Professor of Mineralogy at King’s College, London, and the official “Mineralogist to the Queen”. His expertise in diamonds is credited with the prediction of their existence in South Africa. He was a consultant for the 1852 re-cutting of the Koh-I-Noor diamond. 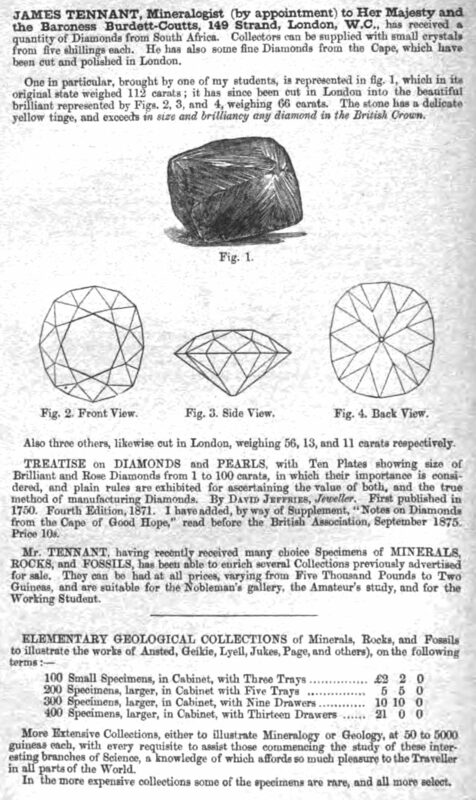 His shop at 149 Strand, London, sold all manners of geological specimens, shaped stone ornaments, models, storage cabinets and, importantly for this essay, objects for the microscope. Slides such as those shown in Figure 1A are seen with some frequency at auctions. They have pre-printed specimen labels that are identical in style to slides sold during the 1850s-60s by Samuel Stevens (Figure 1C). However, they carry an additional, small circular label bearing a handwritten number. Neither the numbers nor the specimen descriptions of the Figure 1A slides match any known Stevens slide list. 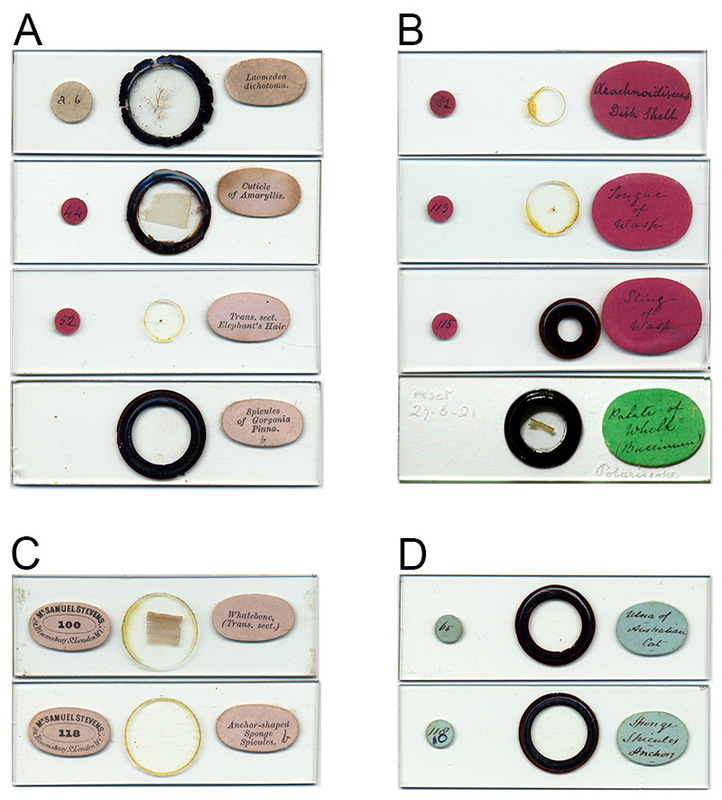 However, they perfectly match the numbered lists of microscope slides published in the late 1850s by James Tennant (Figure 4). Other slides are occasionally seen that have handwritten specimen descriptions and number matching Tennant’s lists (Figure 1B). These can also be attributed to Tennant, and possibly pre-date the printed label variety. Identified slides that match Tennant’s list of "Microgeology and Micromineralogy", number 201 through 278, carry labels that were evidently cut from Tennant’s printed list (Figure 2 and 3). Figure 1. 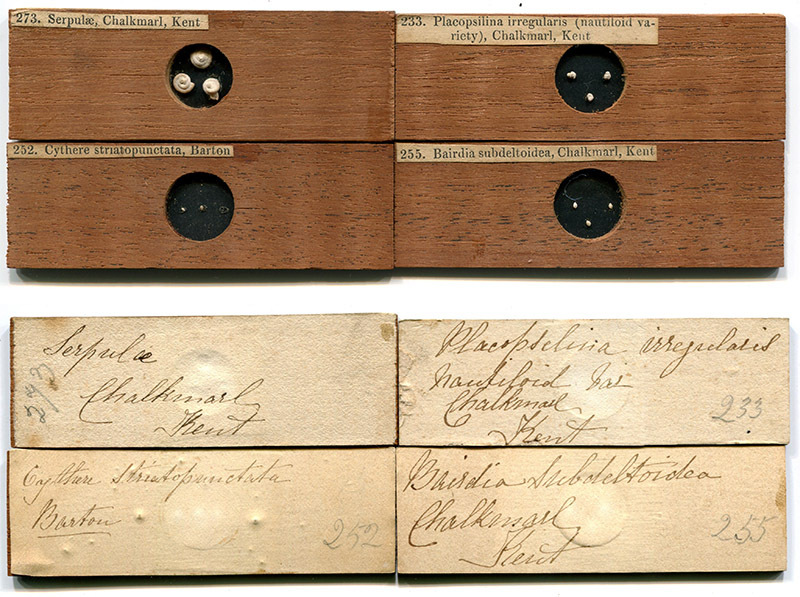 (A) Microscope slides with pre-printed specimen descriptions, attributable to James Tennant. The numbers and specimens match Tennant’s 1858 slide list (Figure 4). The fourth slide down lacks a number label, but the specimen description matches slide number 77 on Tennant’s list, but is absent from Stevens’, and was probably also sold bt Tennant. (B) Microscope slides with handwritten specimen descriptions, also probably sold by Tennant, based on the specimens and numbers. The lower slide, with the green label, has a similarly handwritten description, and matches slide number 26 on Tennant’s list. (C) A contemporary slide retailer, Samuel Stevens, sold slides with specimen description labels of a style identical to those on the Tennant slides shown in panel A. However, the Stevens-labeled specimens do not appear on Tennant’s lists, nor do the Tennant-attributable specimens appear on Stevens’ list. Considering that the businesses of both Tennant and Stevens included many more items than microscope slides, and that neither was a specialist in microscopy, it is very likely that these slides were made by other hands. The identical styles of labels on the slides in panels A and C suggests that both shops were supplied by the same maker at some point in time. (D) Slides with handwritten labels that match Stevens’ slide list, but not Tennant's, and so were probably sold by Stevens. Note that the handwriting on these slides in markedly distinct from the handwritten Tennant slides shown in panel B, suggesting that at least two different slide makers supplied Tennant and Stevens. Figure 2. 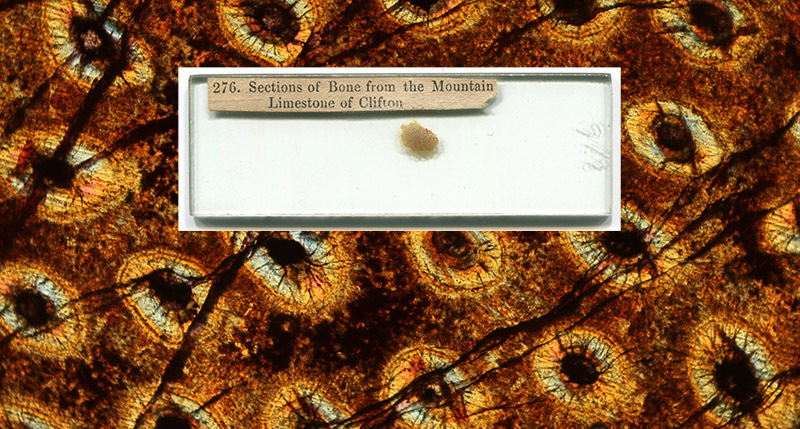 Slide number 276 from Tennant’s list of "Microgeology and Micromineralogy", "Sections of Bone from the Mountain Limestone of Clifton". Microphotograph of the specimen taken with crossed polarizing filters and a yellow selenite. Figure 3. Slides 233, 252, 255, and 273 from Tennant’s list of "Microgeology and Micromineralogy". All four are uncovered, dry-mounts in wood slides. The fronts bear labels cut from Tennant’s list (upper panel). The same descriptions and numbers are handwritten on the backs (lower panel). Figure 4. A September, 1858 advertisement for microscope slides sold by James Tennant, from “The Literary Gazette”. 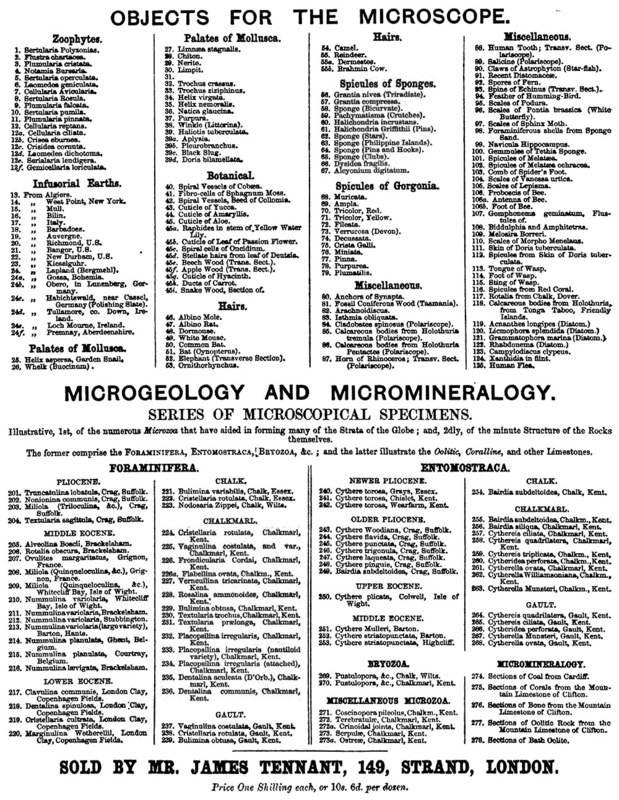 Identical lists appeared in William Buckland’s 1858 “Geology and Mineralogy Considered with Reference to Natural Theology”, and Tennant and Mitchell’s 1859 “Mineralogy and Crystallography”. The slides illustrated in Figure 1, panels A and B, match items on the top list, and slides illustrated in Figure 2 and 3 match items in the lower list. The numbered lists simplified purchases, as a buyer could pre-choose his slides, then either purchase in person or send a servant to place the order, using only the specimen number. Much like ordering a meal in a modern fast food restaurant. Figure 5. 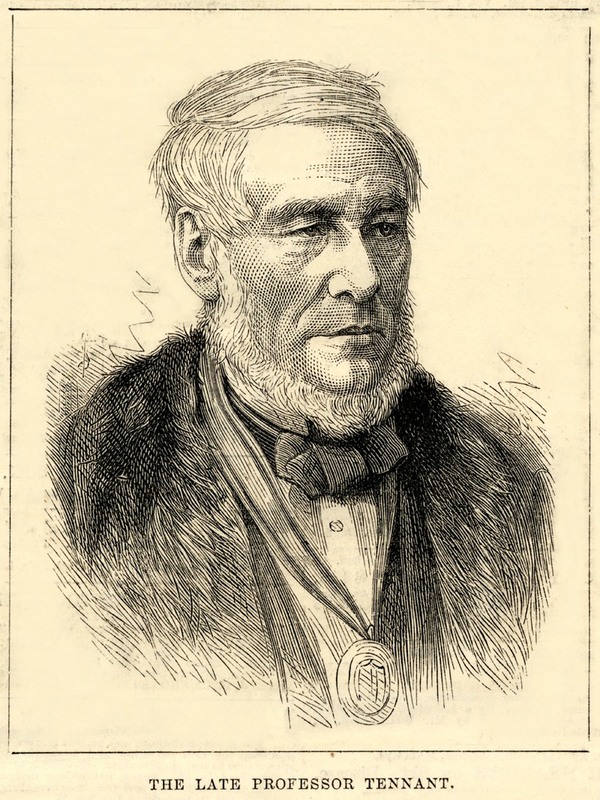 Engraving of James Tennant, from his obituary in the March 12, 1881 “Illustrated London News”. Adapted by the newspaper from an undated photograph. James Tennant was born Feb. 8, 1808, in Upton, Nottinghamshire. He was the third of twelve children born to John and Eleanor Tennant. Some time later, the family moved to Derby. 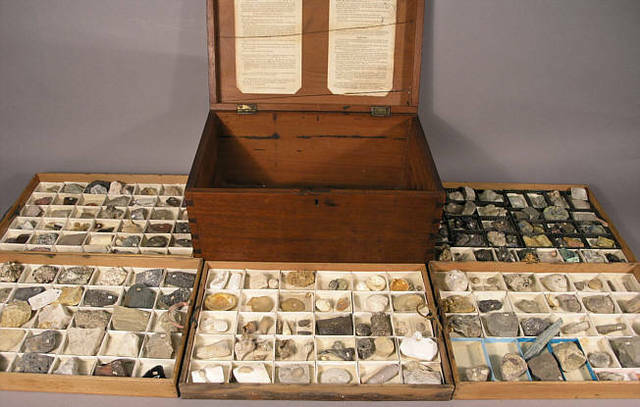 In 1824, when he was 16, James was apprenticed to John Mawe, a London dealer of geological specimens. Mawe was originally from Derby, and family connections probably led Tennant to Mawe. After a stint in the merchant marine, Mawe went to work for the Derby lapidary company of Brown and Son in 1783. He married the boss’s daughter, Sarah, in 1794. That same year, Mawe also became a partner and the manager of Brown, Son and Mawe, located in Covent Garden, London. Mawe traveled extensively, acquiring specimens and establishing world-wide contact for supplies. In 1811, his shop moved to 149 Strand, a busy and fashionable London location. The Mawes also lived at this address, as did employees such as Tennant. After John Mawe died in 1829, his wife continued to operate the shop, with James Tennant as manager. Tennant bought the business in 1840. Sarah continued to live at 149 Strand. Along with the shop and house, Tennant acquired the appointment “Mineralogist to the Queen”, formerly held by Sarah Mawe. Tennant expanded his education by attending classes at the Mechanic’s Institution. He studied mineralogy and gemology under Sir Everard Home, former Physician to the King, and chemistry under Michael Faraday. In 1838, upon Faraday’s recommendation, Tennant was appointed as a teacher of mineralogy at King’s College. The position was later upgraded to Professor of Mineralogy. In 1853, he was additionally appointed Professor of Geology at King’s. He also taught mineralogy and geology at the Royal Arsenal at Woolwich. 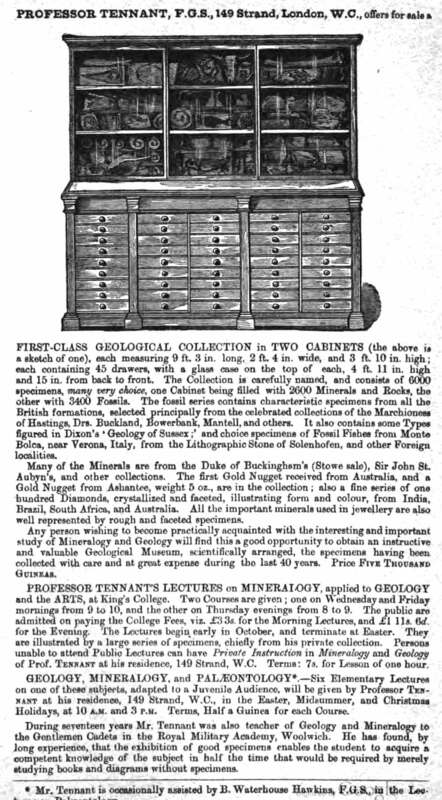 Tennant resigned his Professor of Geology position in 1869 to become curator of the mineral collection of the Baroness Angela Burdett-Coutts, “the richest heiress in England”. Tennant retained his mineralogy professorship until his death, and was renowned for his teaching abilities and devotion to technical education. One of the earliest published records of James Tennant stemmed from his interest in microscopy. Professor William Buckland, in his 1839 Presidential Address to the Geological Society of London, reported one of the first identifications of organic remains in stone, “Mr. Tennant has informed me, that a microscopic examination of the Stonesfield slate by Mr. Darker, and of other oolites, has recently shown them to be crowded with remains of organized bodies, invisible to the naked eye. I learn also from Mr. Tennant, that abundant microscopic organic remains have recently been discovered in thin slices of certain beds of carboniferous limestone from Derbyshire: similar results may shortly be expected from a microscopic examination of the chert of the same formation”. The ”Mr. Darker” to whom Buckland referred was William Hill Darker, at that time one of the most sought-after makers of optical and physical instruments. Darker is better remembered today for his high quality microscope slides of thin sectioned stones and minerals. James Tennant, William Darker and some fifty other men were charter members of the Microscopical Society of London (later the Royal Microscopical Society). His 1881 obituary in the Journal of the Royal Microscopical Society implied that Tennant remained a member of that body until his death. He was also a Fellow of the Geological Society, the Chemical Society, the Mineralogical Society and the Zoological Society (Figure 6). Figure 6. 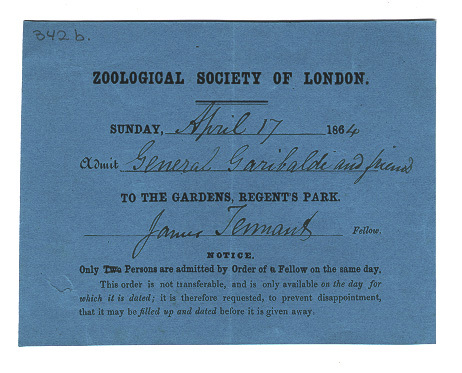 An admission ticket to a Zoological Society function, issued to General Giuseppe Garibaldi and signed by Society Fellow James Tennant. From the Anthony P. Campanella Collection of Giuseppe Garibaldi. James Tennant lived at 149 Strand until the end of his life, passing away Feb. 23, 1881. He never married. A younger brother, Charles, lived with James at the times of the 1841 and 1851 censuses, being listed as an assistant. Censuses also recorded numerous visitors to the house, many of them apparent scientific colleagues. The majority of Tennant’s business was minerals, gems and stone products. He sold carved and turned stone ornaments, made of alabaster, marble and Derbyshire spar (blue john). Tennant was a master of the Turner’s Company (guild of lathe workers), and probably made many of those items himself. Examples of some items sold by Tennant, and advertisements describing his wares, are shown below in Figures 7-11. A fossil that was once in his collection is shown in Figure 12. Tennant began selling off his collection in 1876. At the age of 72, in 1880, Tennant planned to retire, and marked down his prices. He died soon thereafter. His remaining, extensive collection was sold by his executors. It took at least 12 auctions, over the course of nearly a year, to sell off Tennant’s collections. By coincidence, his items were sold by the J.C. Stevens auction house, operated by his old microscope slide-selling competitor, Samuel Stevens. Figure 10. Advertisement from the Annals and Magazine of Natural History, 1879. Note the price of the cabinets and collection. Figure 11. 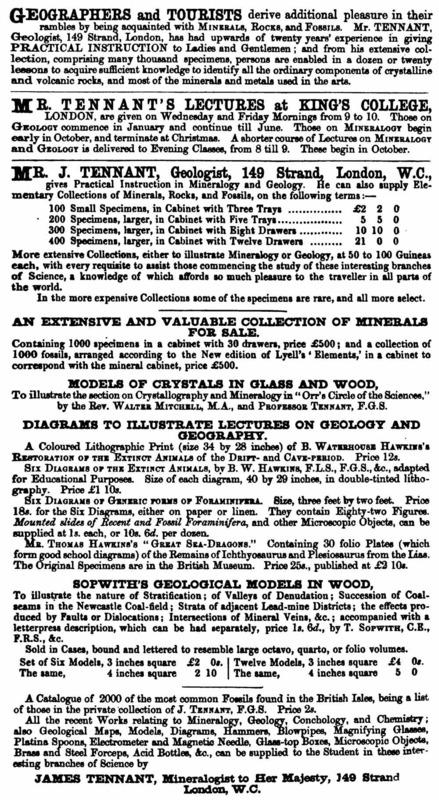 Advertisement from the Annals and Magazine of Natural History, 1879. Tennant sold items that could be purchased by both common folk and the very rich. Figure 12. A fossilized ichthyosaur skull that once belonged to James Tennant. Picture from Wikimedia Commons. Thank you to Richard Courtiour for assistance with identifying Tennant’s slides.